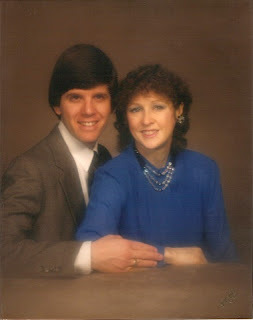 We acknowledged our 36th wedding anniversary on April 9th, but didn't celebrate since neither of us came up with an idea on where to go. We enjoy taking a trip to celebrate rather than eating out or buying gifts, so that's the motivation to work before play. It's truly and finally Spring here at Bluebird Cove. We still have some chilly nights, but the days have been lovely and even a few downright hot, but I won't complain about heat. Right now our focus has been on getting the garden back into shape. Spring is our heavy work time for that since we leave all the leaves on the ground until then to give the plants more protection. We lose less perennials that way and some of the annuals even come back from the roots of the year before. One of the things I struggle with in gardening is cutting blooms to bring into the house so I can enjoy them hour by hour. I always feel a bit guilty since I figure there's something outside that needs them, and yet I do leave plenty in the ground. I tell the ones chosen for the house that they are very special. Of course I don't say that until they're inside so the other plants won't hear [grin]. 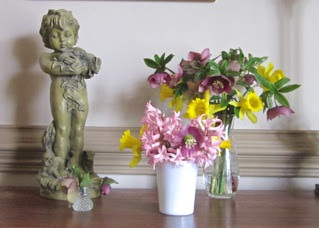 This Spring I made some small bouquets of Hellebores, Daffodils, and Hyacinths. The Hellebores seem to be doubling every year now that they've got their feet settled into the hard Virginia clay that the earthworms have softened for them. Right now all the trees in the forest behind us have lime colored green leaves coming out. Nothing seems to be able to contain itself from bursting forth. I love it! It's like watching God create Earth all over again. The forsythias have just about lost all their blooms and the redbuds are budding. We have a lot of hollies and they're all covered with flower buds. They make a very small flower, but the bees love them and the scent is wonderful to us also. View holly blooms. The butterflies are scurrying about looking for early blooms to feast on. 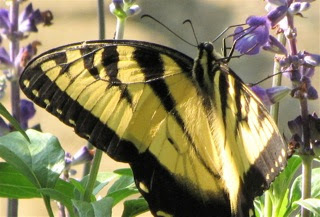 Our state butterfly is the Eastern Tiger Swallowtail, a rather large butterfly and with the bright color of yellow very easy to spot as it is flittering about. On Saturday I was on the screened porch after working in the yard and there were two of them dancing up and down as they were preparing to mate. I imagine we will have such heavenly visions all around us when we get there and spend eternity amongst the many animals. I think we'll even have those things that have gone extinct on our earth. We've not been a good steward of what God made for us, but Heaven will be glorious with all the creatures and blossoms that God designed for our pleasure. We will be able to lie down with these precious beings surely rejoicing with them that the pains and miseries of Earth are far behind us. We purchased some more butterfly favorites at the nursery yesterday and I will be very excited to get them into the ground this week. This year I've put quite a few new things in our deck pots. There's a lot of flowers we can't plant in the ground because the deer will eat them, so I put some seeds in pots to have more color on the deck and more nectar for the butterflies and hummingbirds. I sowed Red Salvias, Hummingbird Salvias (salmon color), Cleomes, Heritage Petunias, Hyssop, and even some Spinach for my hubby's "morning mush" (a VitaMix concoction of veggies, fruits and antioxidant spices). The woods behind our home, and our own acre of wildlife habitat we've developed, are filled with the beautiful songs of so many birds. It reminds me of the Italian tradition of a man wooing his loved one with operatic songs from the street below her window. All these males singing to attract their mates, just like the frog choruses at night, each male trying to convince the female that he is the most handsome of all and the best choice for fathering the females offspring. Listen to audio of our night-time chorus. 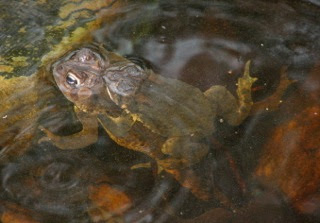 On April 8th I heard the first call of the American Toads. They have a long trilling call that's very recognizable. They used to mate and lay their eggs in our small pond until the huge pond across the street went dry and we had some Bullfrogs set up housekeeping at our pond commanding dominant position since they eat everything else. Apparently they've gone back across the street and our pond is once again available for smaller toads and frogs. On the enlarged version of the photo, you can see the "string of pearls" (eggs) being laid as they are mating. The female is always the larger of the toads so she is on the bottom of this photo and the weight of the male keeps her egg discharge under water. Read more about American Toads. 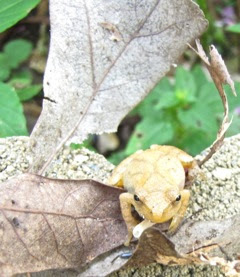 We've had Spring Peepers lay their eggs even before the American Toads arrived. They began singing away as soon as the days warmed up. I love to see all the life that bursts forth from that little backyard pond we put in. It's been such a great addition to our habitat for the last nine years. Life so vividly portrayed in the sounds around us. The Peepers are so loud while we're playing a game on the screened porch that we have to raise our voice to have a conversation. I can hardly go to sleep at night with the wonder of it all and waking up in the morning is like waking up in Paradise. The squirrels may not be singing but they've got vocals of their own and the males are running and chasing the gals all over the property and up and down the trees. 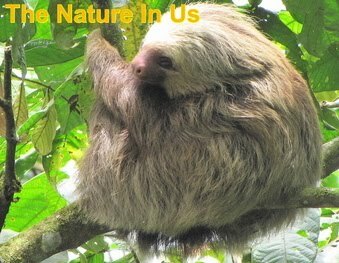 Leaping from small branch to another tree and simply crazy "in love" with those females. Watch a video of a male that is happy to procreate as God told them to do. As I mentioned in the beginning of this newsletter, we'd like to take a short trip to celebrate our anniversary. One of the places we've been considering is Columbia, SC. We rather love the state of South Carolina and have been to many places there, but are not familiar with Columbia. Anybody live there? What places are a "must see" in your opinion? Please let me know! Congaree National Park is definitely already one of our "must see" places. Absolutely awesome! On my health, I did an update post on the blog last week after a visit to the doctor. I also did an update on that post this morning since things have been improving (Counterattack of The Devil - A Health Update). As stated in the post, I communicate through the blog with family and friends so that I don't have to keep repeating "bad news" which I believe becomes part of us if we repeat it often enough. It's time to be outdoors, so hope all of you have scheduled times to see all that Spring has to offer in your area of the world. Wash the winter blues away and rejoice in the beauty and freshness of Spring! Abundance of Blessings to YOU!